Size, Proportion, Substance: Size – Shoulder height for males, 24 to 27 inches; females, 23 to 26 inches. Weight for males, 55 to 80 pounds; females, 45 to 70 pounds. Animals that appear to be over or under the prescribed weight limits are to be judged on the basis of conformation and condition. Extremely thin or fat dogs are discouraged on the basis that under or overweight hampers the true working ability of the Gordon Setter. The weight-to-height ratio makes him heavier than other Setters. Proportion The distance from the forechest to the back of the thigh is approximately equal the height from the ground to the withers. The Gordon Setter has plenty of bone and substance. Forequarters: Shoulders fine at the points, and laying well back. The tops of the shoulder blades are close together. When viewed from behind, the neck appears to fit into the shoulders in smooth, flat lines that gradually widen from neck to shoulder. The angle formed by the shoulder blade and upper arm bone is approximately 90 degrees when the dog is standing so that the foreleg is perpendicular to the ground. Forelegs big-boned, straight and not bowed, with elbows free and not turned in or out. Pasterns are strong, short and nearly vertical with a slight spring. Dewclaws may be removed. Feet catlike in shape, formed by close knit, well arched toes with plenty of hair between; with full toe pads and deep heel cushions. Feet are not turned in or out. Hindquarters: The hind legs from hip to hock are long, flat and muscular; from hock to heel, short and strong. The stifle and hock joints are well bent and not turned either in or out. When the dog is standing with the rear pastern perpendicular to the ground, the thighbone hangs downward parallel to an imaginary line drawn upward from the hock. Feet as in front. Color and Markings: Black with tan markings, either of rich chestnut or mahogany color. Black penciling is allowed on the toes. The borderline between black and tan colors is clearly defined. There are not any tan hairs mixed in the black. The tan markings are located as follows: (1) Two clear spots over the eyes and not over three quarters of an inch in diameter; (2) On the sides of the muzzle. The tan does not reach to the top of the muzzle, but resembles a stripe around the end of the muzzle from one side to the other; (3) On the throat; (4) Two large clear spots on the chest; (5) On the inside of the hind legs showing down the front of the stifle and broadening out to the outside of the hind legs from the hock to the toes. It must not completely eliminate the black on the back of the hind legs; (6) On the forelegs from the carpus, or a little above, downward to the toes; (7) Around the vent; (8) A white spot on the chest is allowed, but the smaller the better. Predominantly tan, red or buff dogs which do not have the typical pattern of markings of a Gordon Setter are ineligible for showing and undesirable for breeding. Predominantly tan, red or buff dogs are ineligible for showing and undesirable for breeding. Gait: A bold, strong, driving free swinging gait. The head is carried up and the tail “flags” constantly while the dog is in motion. When viewed from the front, the forefeet move up and down in straight lines so that the shoulder, elbow and pastern joints are approximately in line. When viewed from the rear the hock, stifle and hip joints are approximately in line. Thus the dog moves in a straight pattern forward without throwing the feet in or out. When viewed from the side, the forefeet are seen to lift up and reach forward to compensate for the driving hindquarters. The hindquarters reach well forward and stretch far back, enabling the stride to be long and the drive powerful. The overall appearance of the moving dog is one of smooth flowing, well balanced rhythm, in which the action is pleasing to the eye, effortless, economical and harmonious. 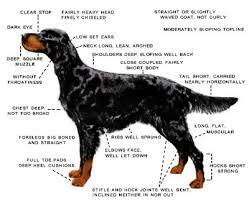 Temperament: The Gordon Setter is alert, gay, interested, and confident. He is fearless and willing, intelligent and capable. He is loyal and affectionate, and strong minded enough to stand the rigors of training. I was just joking on relentless, I know it wasn’t n the standard. But jokingly should be. Thanks Sally for posting the current standard for easy access! You found it! Thanks for your help with the order of things, this needed to be on top and I hadn’t realized it wasn’t! Takes a village to raise a blog!